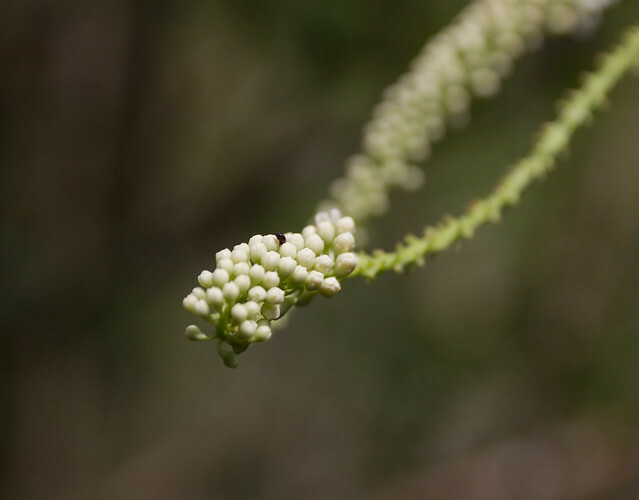 Was stuck in the apartment almost all day Saturday, and was only able to do a short hike. 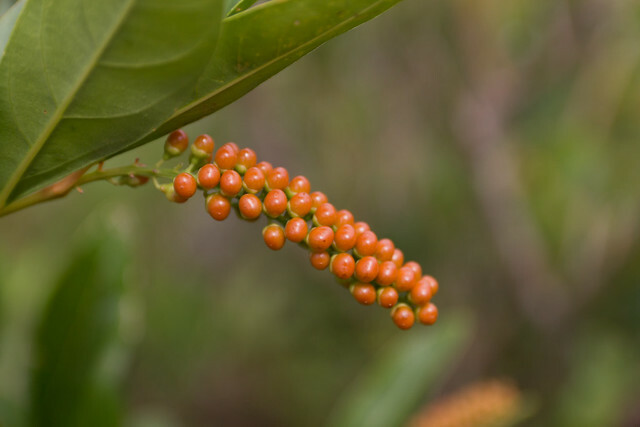 I decided on doing the short, but rewarding Pu`u Pia trail in Manoa Valley. 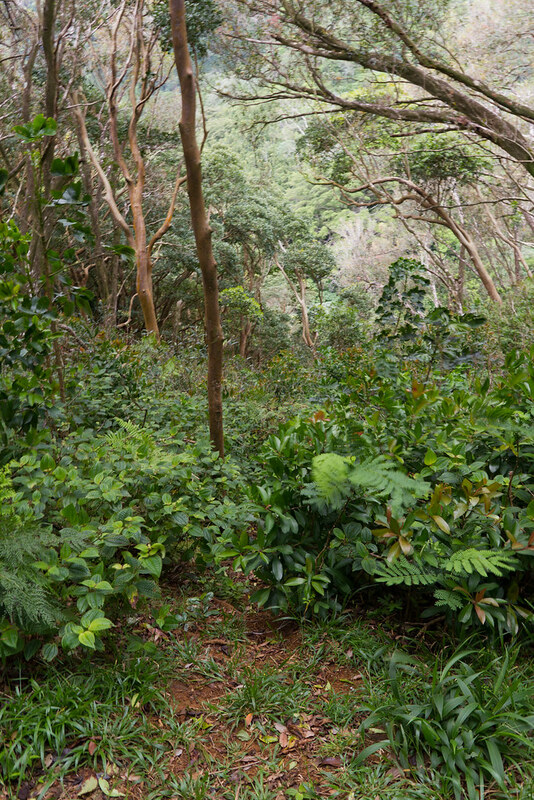 You start on Alani Lane, a short cul de sac off a tight corner on Alani Drive along the southern face of Manoa valley. 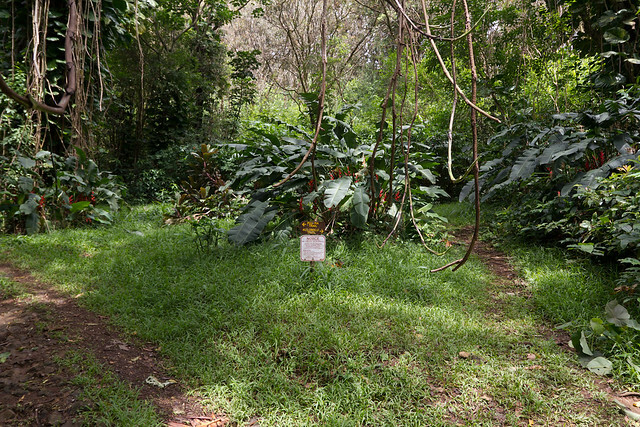 The trail head is at the end of Alani Lane. 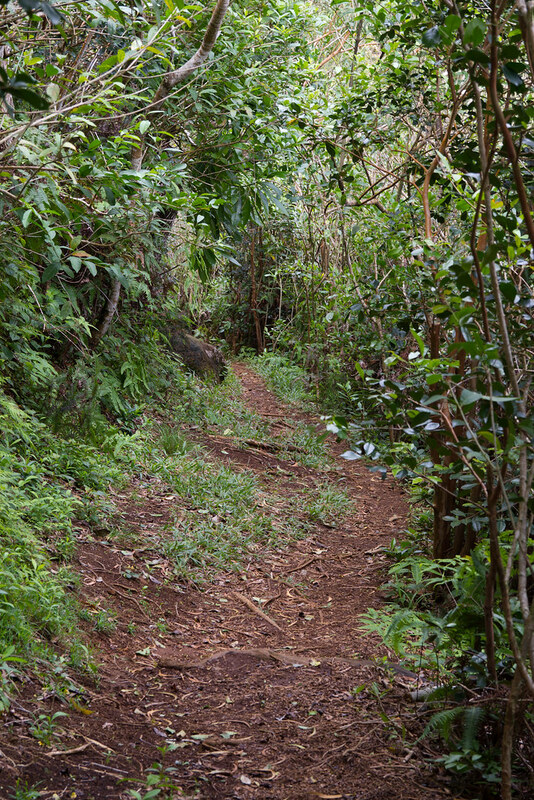 The trail immediately forks and one prong takes you to Pu`u Pia and the other up the valley wall on the Kolowalu trail. 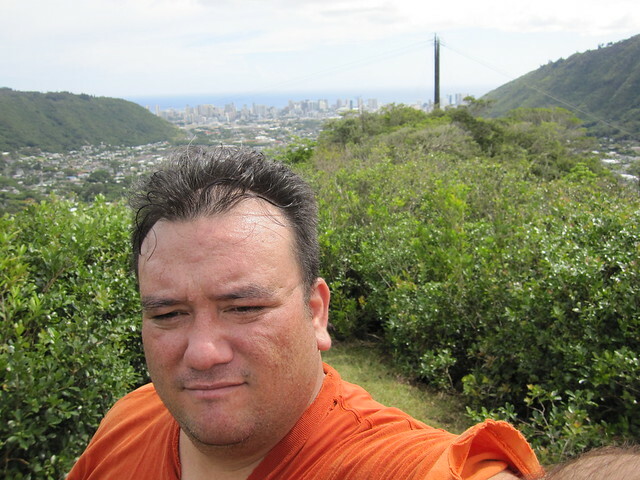 In 2006, my sister Pohai and my cousin Hali accompanied me up Kolowalu to the end of the maintained portion of the Wa`ahila trail, where we hiked to the summit of Awaawaloa on an adventure that should someday be written in a tail that would rival a Homer epic! 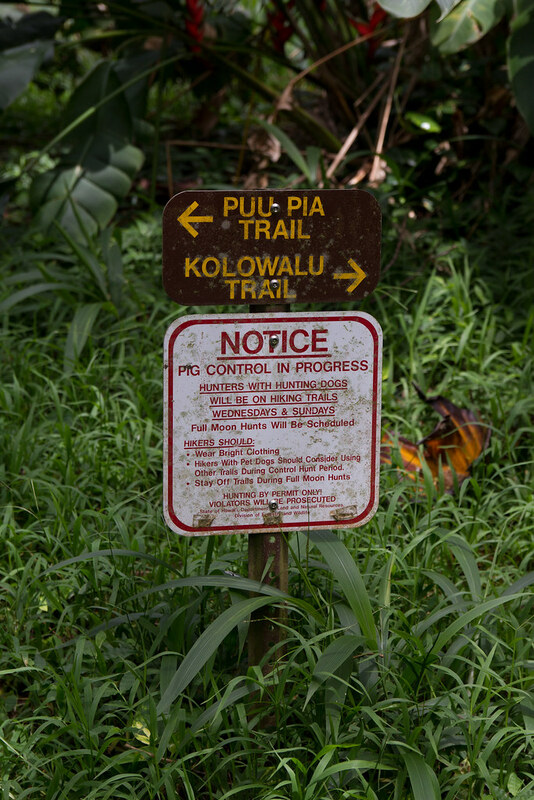 In reality, there really is no reason to go up the Kolowalu trail. 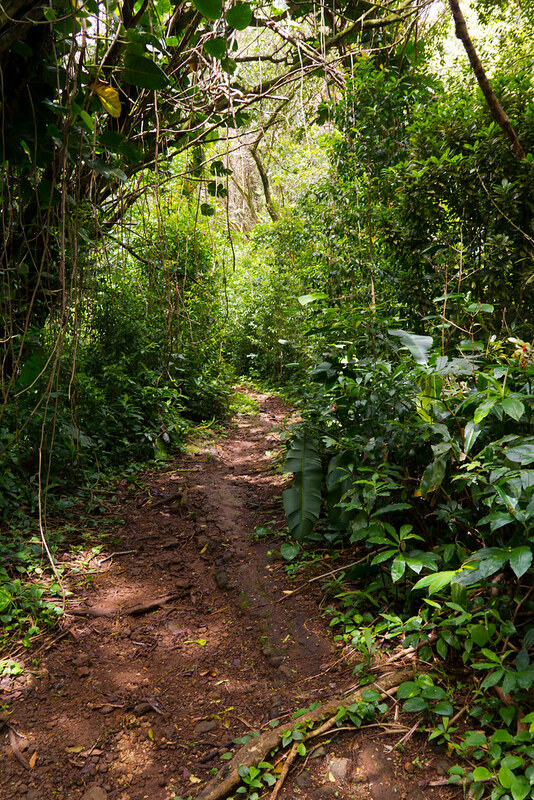 The trail offers no views and is a strenuous trek up a side ridge to the top of the Wa`ahila ridge. 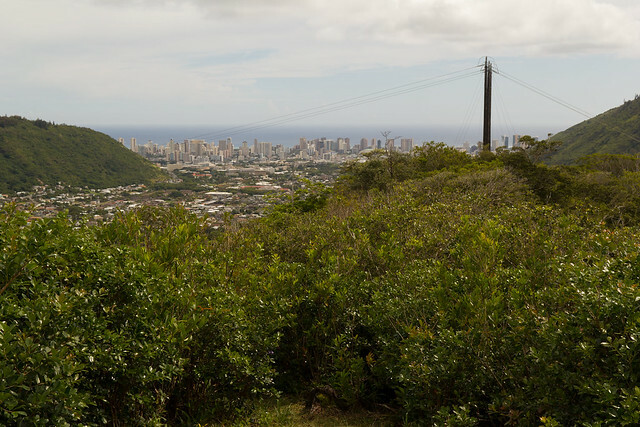 Drive (or take the bus) up St. Louis heights and hike the Wa`ahila Ridge from the top. 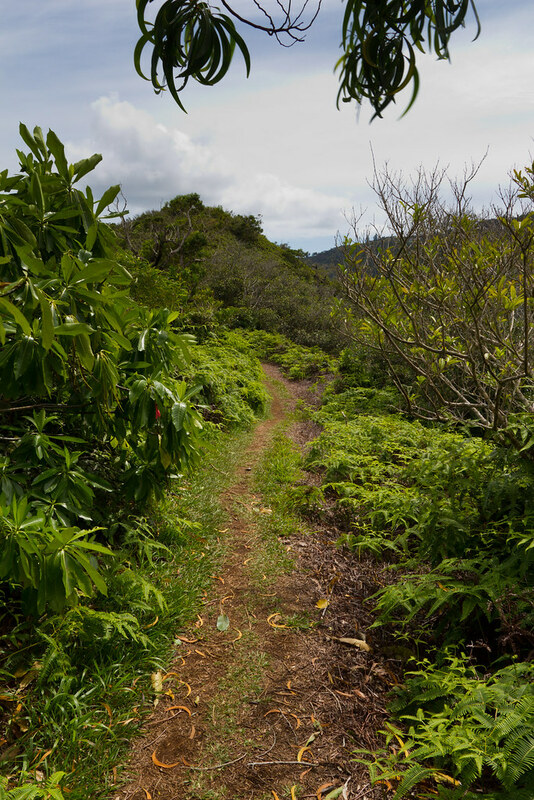 That trail offers much better views and is much more interesting than Kolowalu. Along the side of the trail early on are the remains of a automobile or some sort of vehicle. 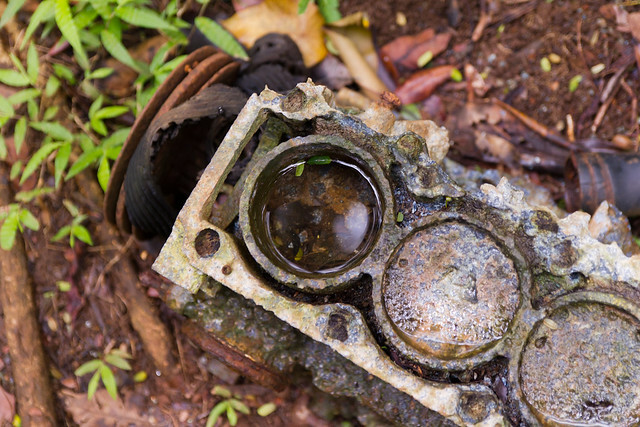 There are hardly any remains of the vehicle, but the engine block seemed pretty intact. 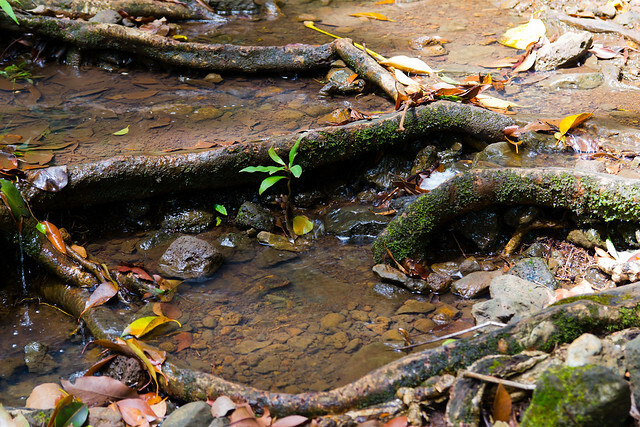 In one of the cylinders a tadpole was living and growing in the water that had pooled there. I tried to take his picture, but he hid under some leaves in the water. 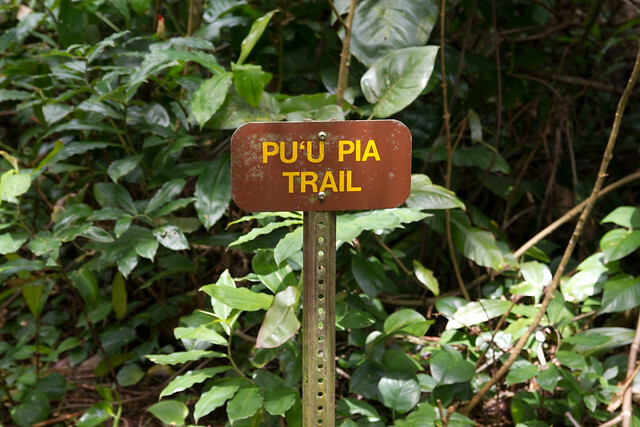 The trail gradually climbs up to a saddle behind Pu`u Pia. 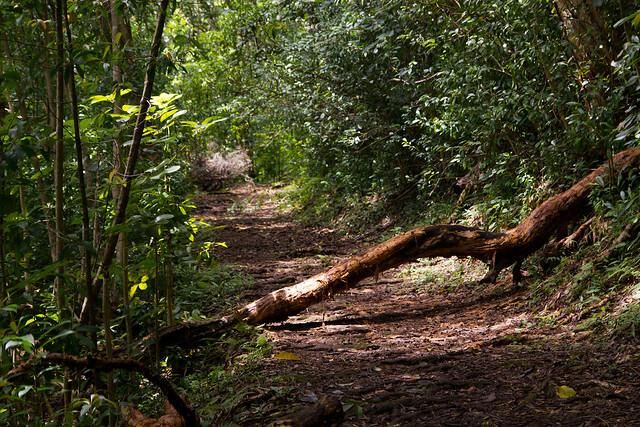 The trail is slick from the recent rains that have soaked O`ahu. 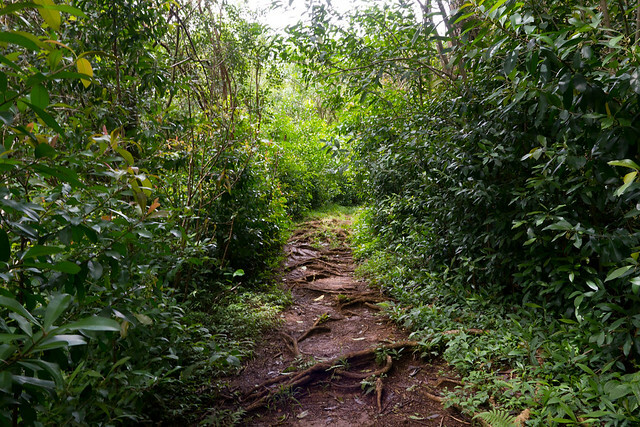 I'm sure this trail is constantly moist year round from the constant Manoa showers. 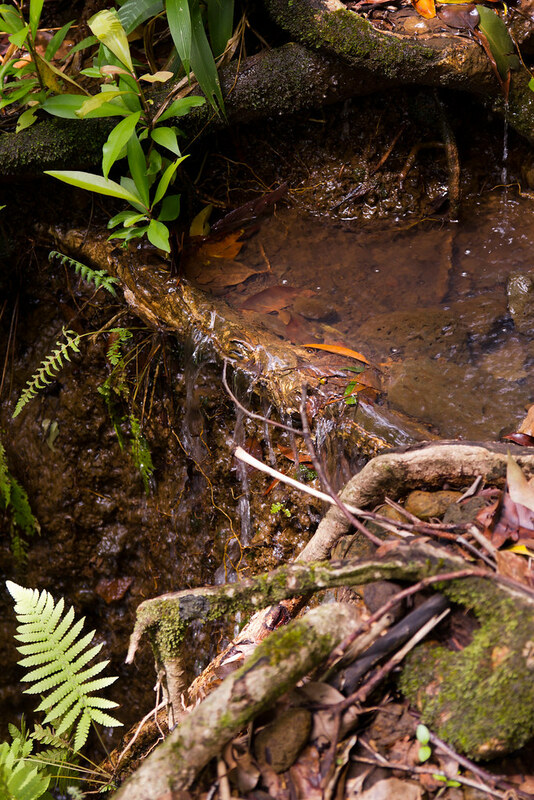 Along the trail you cross a couple of trickling streams. 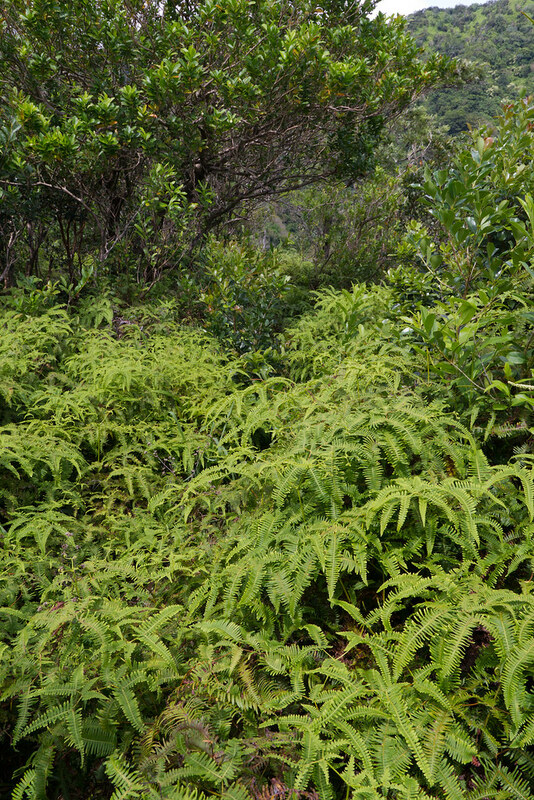 Soon you come to a saddle on a small ridge at the back of Manoa Valley. 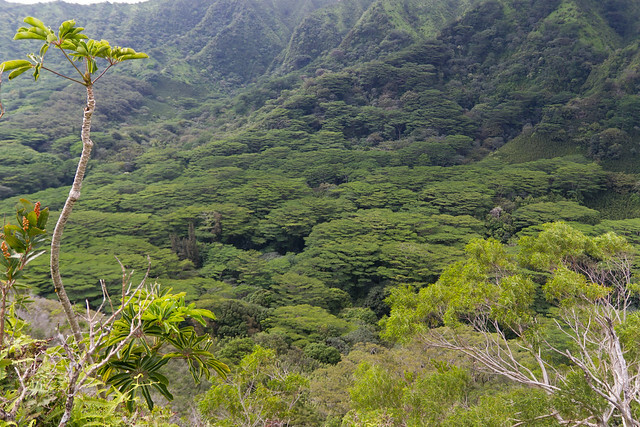 From this ridge the trail turns back out towards the mouth of the valley and up Pu`u Pia. 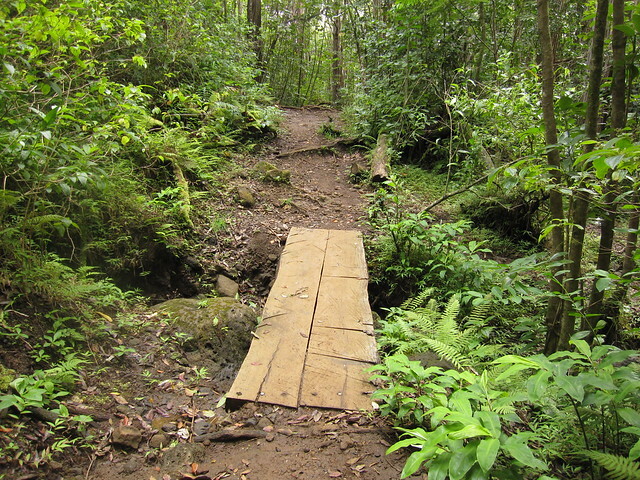 From the saddle you can take a side ridge that leads to the Waiakeakua Stream and Falls (an ancient sacred water reserved for na ali`i). 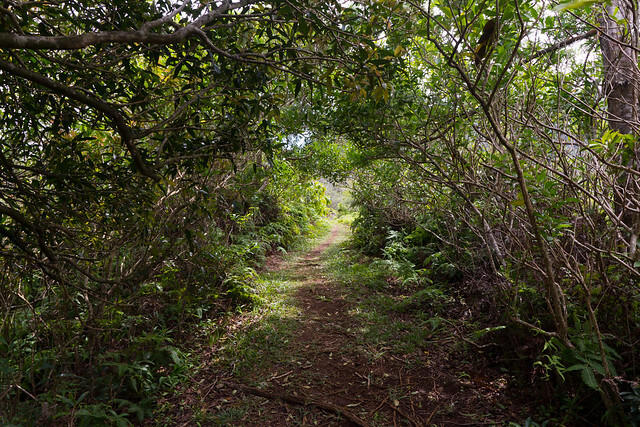 The same side trail will also take you to the Manoa middle ridge trail, an unofficial and non-maintained ridge trail between Konahuanui and Wa`ahila. 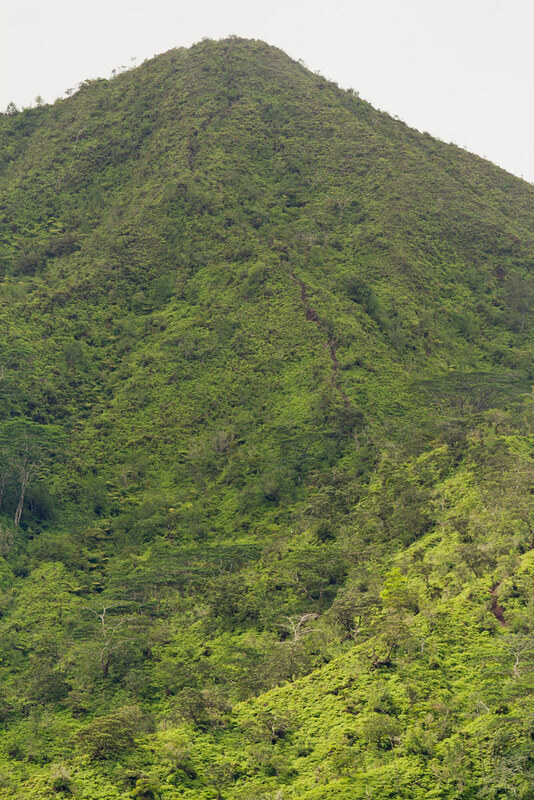 A view of the Manoa Middle Ridge, the trail of brown snaking up the green uluhe covering the summit ridges. From the saddle the trail heads up Pu`u Pia and as you rise from the valley, the trail becomes less muddy, less crowded with tree roots, and actually becomes grass covered as you reach the top, evidence that this trail doesn't get as much traffic as in the valley. 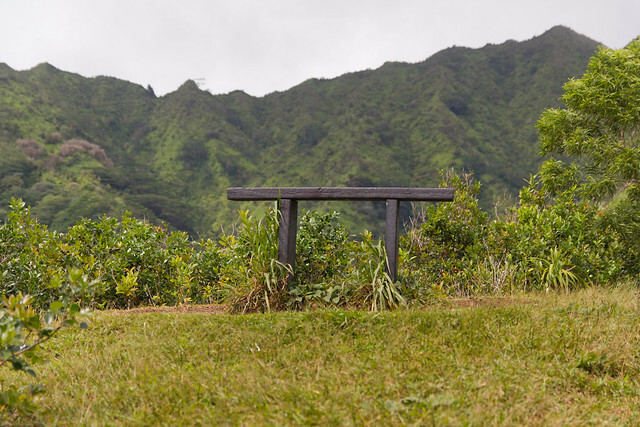 At the top of the Pu`u, and the official end of the trail is a nice, wide grassy section with a little bench to rest on. From there you are given some great views out to the ocean. 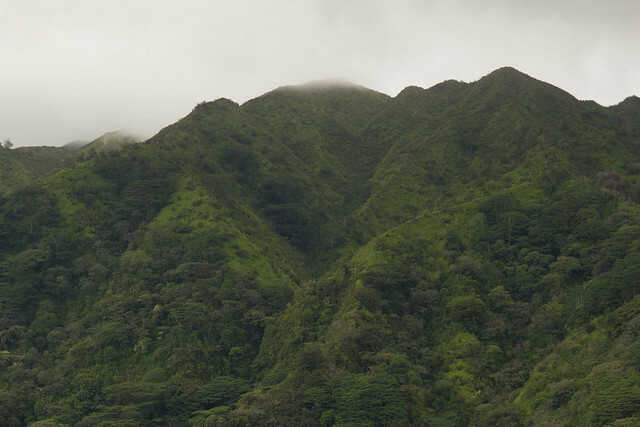 And some stunning views of the Ko`olau pali at the back of Manoa Valley. From the end of the trail you can continue forward to the power/telephone pole at the front of the ridge. 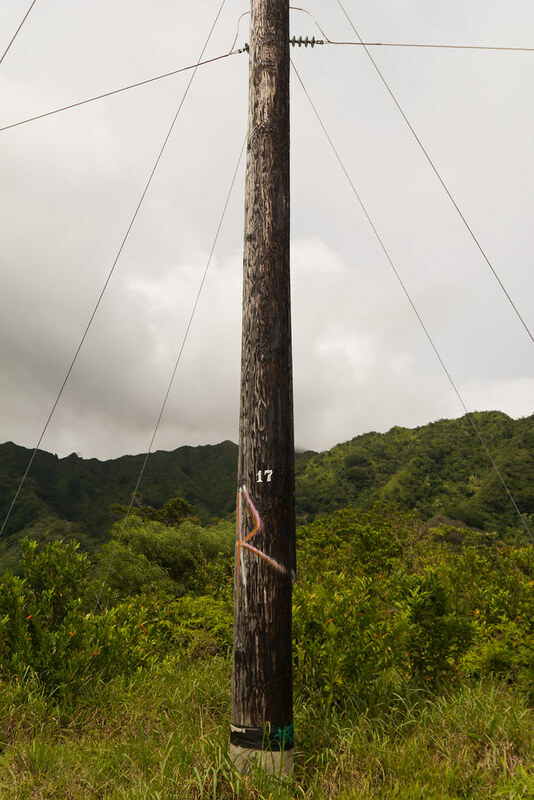 You can even hike all the way back to the beginning of the hike, taking a short cut down to the trail head on a side trail past the telephone pole. 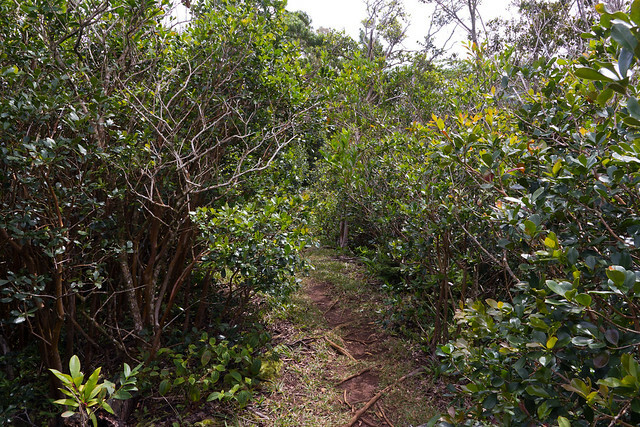 The trail beyond the summit is choked with chest high uluhe, and will make for a scratchy and itchy hike. 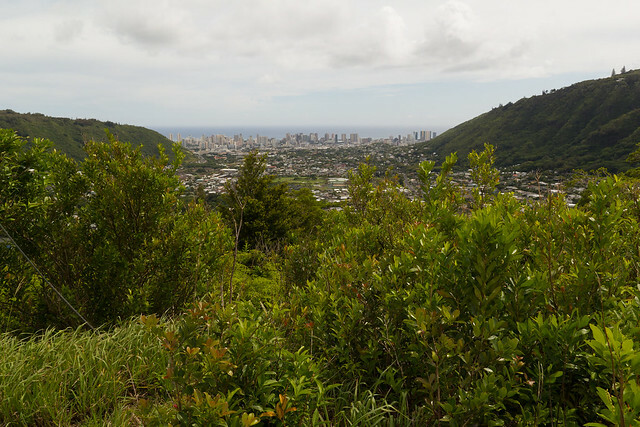 But, you are rewarded with a less obstructed view of Manoa and the back of Waikiki. 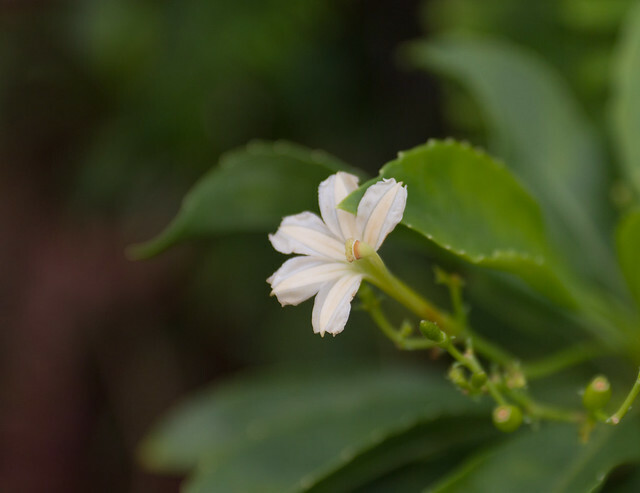 There are some pretty flowers and plants along the way. 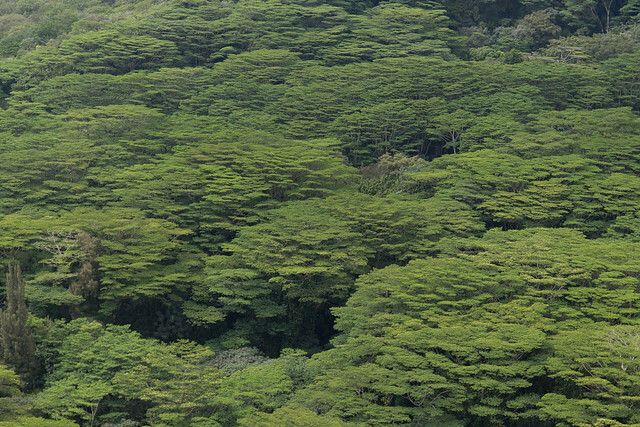 And a nice view of the giant "broccoli" growing at the back of Manoa Valley. The trail is just over 2 miles total, and an elevation gain of about 600 feet. Can easily be done in 1.5 - 2 hours. The rest of the pictures here (on a map overlay of the area). still gotta adventure up that way soon!